As mentioned in the intro post, I have come a long way in the past several months. Now I ride a lot faster, stronger, and feel much better afterward. I’m fortunate to live right next to Fort Jackson in Columbia, SC, which is pretty much the town’s mecca when it comes to cycling. Cyclists are allowed almost complete access provided we follow certain rules, such as obeying all traffic laws, riding single file on busy roads, not listening to music while riding, etc. Worries about traffic are non-existent. The traffic that is there is used to cyclists so they always give us plenty of road. At the back of the fort there are miles and miles of smooth pavement, complete with some steep, gut-wrenching hills. Access to the fort has significantly helped with my training. As a weekend warrior, I log around 80-100 miles a week, weather permitting. With daylight savings time around the corner, I should be able to log more miles and hours. After spending a lot of intense training with the Allez, I knew it was not going to be the permanent bike for me. Upgrades were not feasible because, just like a computer, it is far more expensive to replace a part at a time than buying a brand new machine. 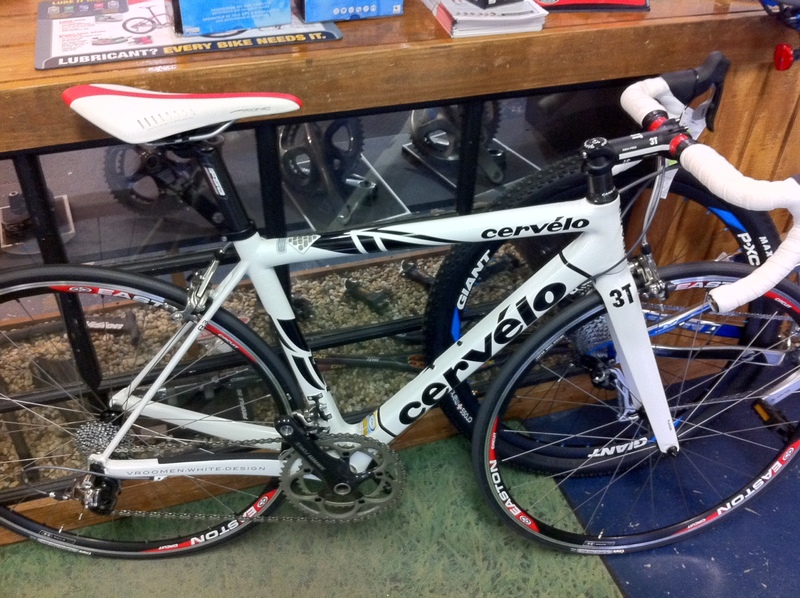 Knowing I had my work cut out for me with Mitchell, I went a little further than I should and grabbed a Cervelo R3. Alright, so I went a LOT further. This bike cost as much as my first three cars combined. It was a steep investment, but well worth it for me given my commitment level. I’ve had it around two months now and it has made a world of difference. Not only is it a faster and lighter bike, but it is comfortable as can be. With the Allez I would feel every bump in the road. Comparatively, the Cervelo rides like a dream — like going from a Pinto to a Lexus. Certain things that I struggled with on the Allez I now take for granted with the Cervelo. For instance, I had to hold onto the old bike a lot tighter and lean over more in order to keep control, while with the Cervelo I am able to lighten my grip and control the bike even better. Now that I have some better legs for riding, I have a rigid training and nutrition schedule for the next few months. This weekend I will begin by climbing some mountains up near Spartanburg, SC — specifically the Saluda Grade and Watershed area. This will be my first mountain experience. Just about every weekend afterward I will be participating in an organized ride. A few of them are in the mountains, although most are local, easier rides. The big upcoming rides are the Marquis de Sade, which is a Mitchell-specific training ride put on by the Freewheelers of Spartanburg, and Assault on the Carolinas, which climbs Caesar’s Head Mountain. Nutrition is a big topic and deserves its own blog post down the road. This entry was posted on Friday, March 11th, 2011 at 9:31 pm	and posted in Blog, Training. You can follow any responses to this entry through the RSS 2.0 feed.